Is there hope for a messed up pastor’s wife? She can’t figure out who she is or what she’s supposed to be doing, but she’s expected to be a leader in the church. What would happen if the truth came out? How conflict and bitterness makes her want to stay at home on Sunday mornings in her pjs? How her own struggles with anger are compounded by a spouse who is never home? 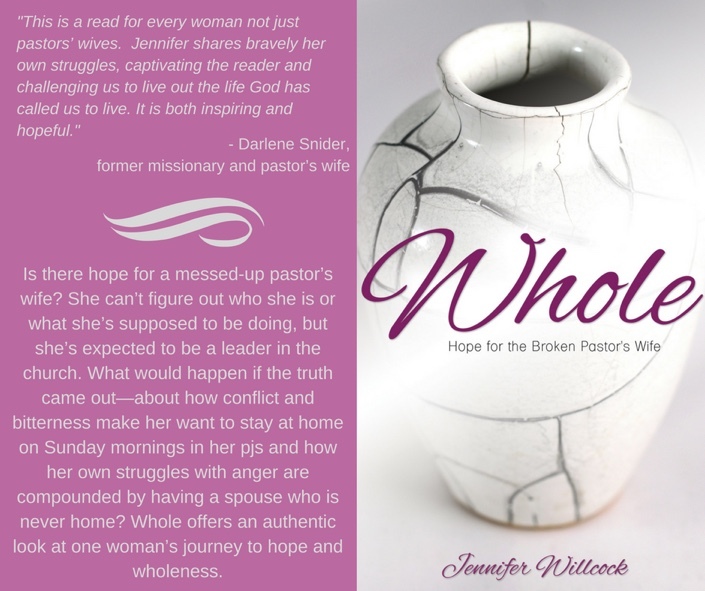 Whole offers an authentic look at one woman’s journey to hope and wholeness. This is a book for pastors’ wives and women in ministry leadership, who struggle with their roles, their families, and ministry. Whole offers hope and encouragement to these women, who are looking for authenticity in their lives. It’s also a book for anyone who has felt like they didn’t fit the role God was calling them to. “I think you’ve got it wrong, God” might be a phrase you’ve thought over and over. Whole is for you! Whole also provides insight for anyone who has ever wondered what leaders struggle with in their own lives and how they might pray for them. You can listen to me read Whole on Hopestream Radio, Wednesday mornings at 10am. Click here to catch up on past programs. Check out the radio interview I did with Hopestream’s Ron Hughes about Whole here. Reviews are always appreciated! They do make a difference for authors starting out. You can leave a review at any of your favourite online shopping sites or on Goodreads. Thanks so much!